Having safe treats for birthdays and holidays is always a challenge for those on Special Diets – let’s be honest most of us aren’t Master Bakers! However, now there is another great option with Cupcake Heaven up in Sidney. Aside from baking terribly tasty and funky treats, they are willing to cater to many diet requests, including Gluten-free baking. Not only that, they try to make sure those goodies are just as decadent and naughty as the original. 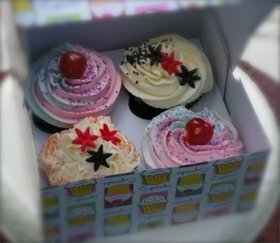 It’s definitely worth the short drive but make sure you’ve called to pre-order; regular stock does sell out and specialty cupcakes are made to order. Mmm! What a happy find!